In many videos of the legendary artist Feng Zhu I’ve heard him mention that concept artists should really consider themselves to be designers. This seems like a strange statement but I’ve found a lot of truth in it. Concept art isn’t just art created for art’s sake. It’s a way of conceptualizing characters, environments, and props to give them life in a piece of work. Contrast this with illustration where the art is often the final piece of work. The goal of a concept artist is to provide ideas in a creative pipeline. But how does this lean towards a career in design? Feng argues that concept artists get paid to create designs and bring them to life with art. 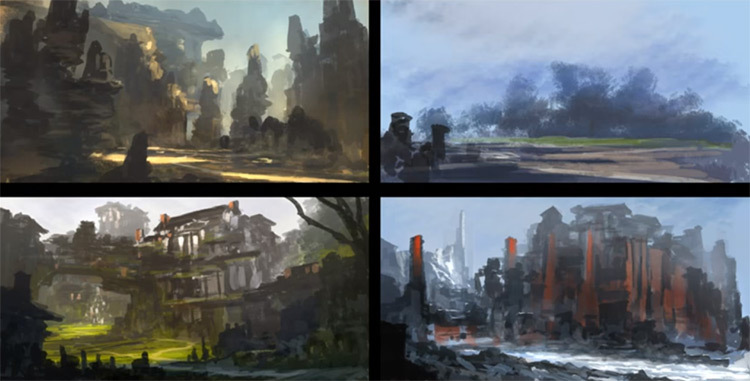 In most scenarios the concept artist brings together ideas like landscapes and environments. The art director may have a goal in mind, but it’s the concept artist’s job to bring this idea into the real world. Just because you have artistic skill doesn’t mean you’re able to create masterful video game art—at least not yet. When given an idea you may be able to render it perfectly with varying perspectives and accessories. But this is merely the artistic side of the job. And while it is important, there’s a lot more to be said about video game art and how it applies to a designer’s mindset. A designer creates something from scratch with ideas pulled from real life and imagination. The job of a designer is to conceptualize and birth new ideas. Many people hear the term “designer” and associate it with digital graphics or web design work. And these jobs do technically involve design because they craft items that have never before existed. Artists and designers overlap in many key areas. They both love to create, and they both thrive off unique ideas. There is one interesting difference in that designers are primarily problem solvers. Concept artists get paid to solve creative problems by designing animals, characters, weapons, vehicles, and environments that blend seamlessly into an imaginary world. This process involves designing by following creative requirements. So how can you practice this technique of digital design? Let’s say you’re already comfortable with your technical art skills. If you’re not then I highly recommend the Proko figure course to get started. But if you already have the ability to draw & paint then you’re most of the way there. To practice design is to practice idea generation. Do lots of thumbnail sketches to put down ideas quickly. Force yourself to design five or six completely unique characters from scratch. If any two look alike scrap them all and start over. This exercise is very demanding and certainly not the norm in a real world setting. But it will push you to your limit and force you to think critically about every mark you put down. Designers often work with something called a creative brief which can be passed down from the art director or creative director. If you’re working for yourself it may be worth generating your own creative brief to limit the scope of your designs. When you’re tasked with designing an armored soldier you’re basically given a free pass to try anything. Should this soldier have a helmet, spikes, or other notable accessories? These details are usually left up to the designer. You really want to think of yourself as a designer specializing in concept art. If you can imagine a concept in your head and put it down on paper then you’re working to build the skillset of a true concept artist. Many new artists feel stuck with a limited vocabulary of ideas. This can also happen to skilled artists who bump into a creative block where it seems like ideas just won’t flow. There are many techniques you can practice to improve your creativity, but the best is to keep drawing as many different things as you can. There’s so much crazy stuff in the world and this stuff is always the best source of inspiration. How could you paint something you never knew existed? 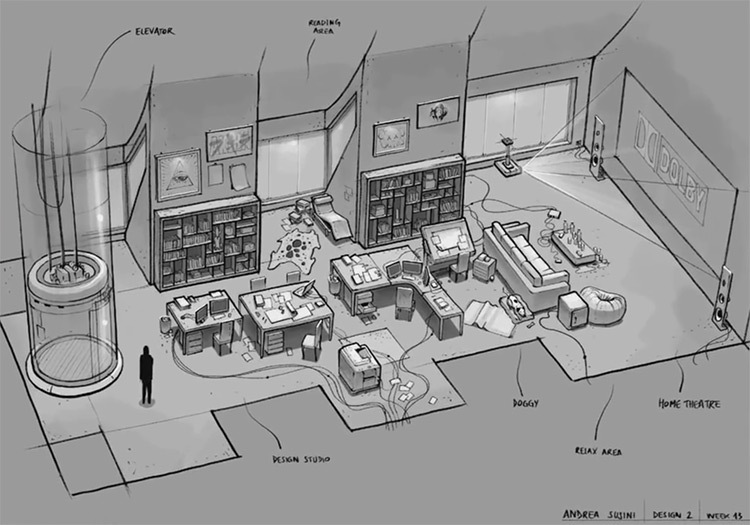 Unknown yet fascinating items like backyard trellis’ and overwater bungalows require some knowledge that they exist before they can be incorporated into concept art. If you see something you don’t understand try looking it up. The Internet is your greatest resource for photographs and finding weird objects to draw. Beyond studying from life you should also check out existing concept art. You may find a character design with a unique bit of clothing, or a scimitar with a unique handle. The recurring point here is to get curious about life and remain curious in your artwork. In time you’ll bump into aesthetic styles and mysterious things you never knew existed, and your visual library will expand a little bit more. You can easily pick up dozens of books and courses that teach you how to draw. There’s no end of content teaching these techniques because while they are difficult, they’re still relatively straightforward. But it’s not easy to teach someone how to design. It’s not easy to force someone to be creative and curious in their artistic pursuits. And since this quality is so hard to teach, it becomes a true asset for anyone hoping to work as a concept artist. The more you study the more you’ll learn and implement into your work. All the best designers and artists started with terrible work. Persist and be willing to try new things. Painting the same subjects over and over will help you master those things, but will never truly expand your ideas. If there’s one piece of advice I can offer it’s to remain curious. There’s never an “end” to the artistic journey, and you will die long before you can fully comprehend everything there is to see in this world. Just enjoy your process and always be on the lookout for new things to learn.